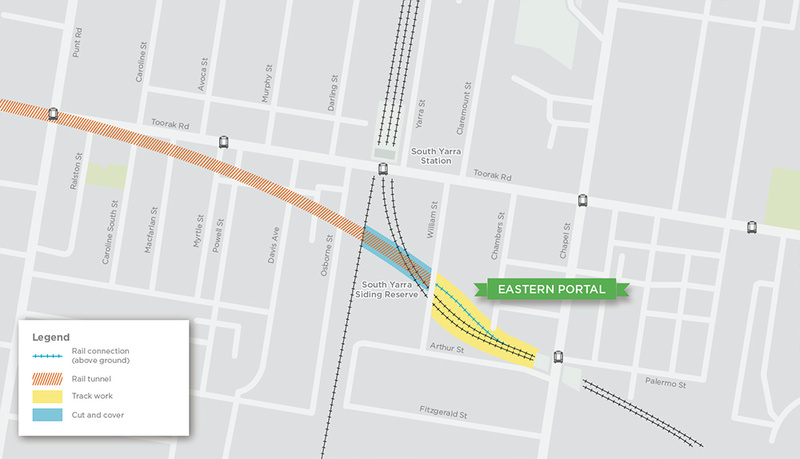 The eastern tunnel entrance will be located in the South Yarra Siding Reserve. A decline structure, or descending tracks, will be built so trains can enter the new Metro Tunnel near William Street and pass underneath the Sandringham and Frankston lines. From the eastern tunnel entrance, the tunnels will pass under Osborne Street, Davis Avenue, Powell Street, Myrtle Street and Macfarlan Street and travel west under Toorak Road and St Kilda Road to connect with the new Anzac Station. A ventilation shaft that will be used for maintaining air quality during tunnel maintenance and removing fumes in the event of an emergency. The Metro Tunnel will be used exclusively by electric trains, which do not emit fumes. An emergency access shaft to allow emergency crews to access the tunnels in case of emergency. Details of these structures were provided in the Cross Yarra Partnership Eastern Portal Development Plans. Other utilities required for the eastern tunnel entrance will be located below ground or within the rail reserve where possible. A new station in South Yarra or connection from the existing station to the Metro Tunnel is not in the scope of the project. The rail corridor near South Yarra Station is a complex and constrained urban environment, making it a challenging place to build new platforms. The Metro Tunnel allows for longer, high capacity trains. Longer trains need longer platforms and it is difficult to accommodate lengthy platforms in South Yarra without causing significant impacts to the surrounding area during construction, including increased land acquisition. Upon completion of the Metro Tunnel, passengers using South Yarra Station will benefit from improved capacity and more frequent services on the Frankston and Sandringham lines. While upgrades to the existing South Yarra Station are not in the scope of the Metro Tunnel, that does not mean that improvements will not occur in the future. Improvements to stations are considered by Public Transport Victoria through its network development planning. Rail Projects Victoria (RPV) will work with the City of Stonnington and other South Yarra stakeholders as the project is planned and developed.